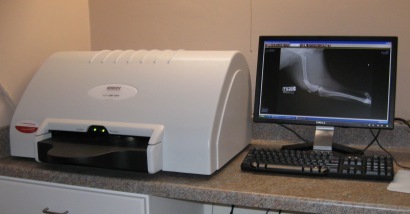 Tri-City Animal & Bird Clinic is equipped with a start-of-the-art digital radiography system. Digital radiography produces x-ray images without the use of film, chemicals, or an x-ray darkroom. Instead, a digital radiography system captures x-ray images on an electronic detector or screen, converts those images to a digital format, and displays them on a computer monitor. This allows us to take "x-rays" of patients as small as parakeets to patients as large as great danes. Using computer software the x-ray images can be enhanced or enlarged making it easier to evaluate patients of all sizes. This technology greatly increases our diagnostic capabilities and is a significant advance over the use of x-ray film to take radiographic images. Furthermore, we can copy your pet's radiographs to a CD allowing easy transfer of images to veterinary specialists. You can even take a copy home with you to look at on your home computer!